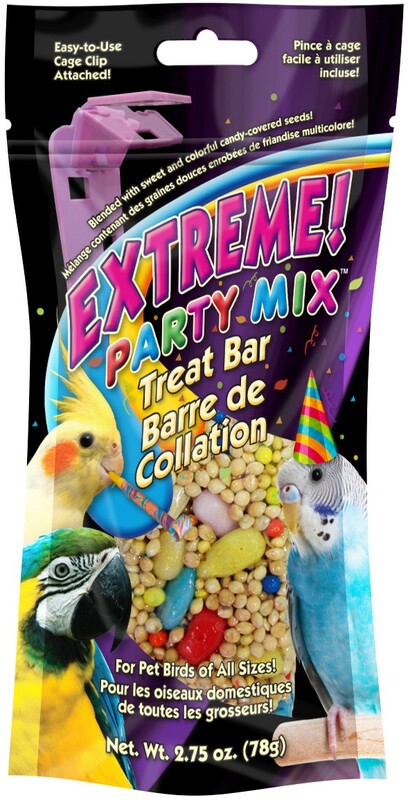 Extreme Party Mix™ Treat Bars for pet birds are jam-packed with delicious wholesome seeds, candy-covered sunflower hearts and candy-covered millet. Extreme Party Mix™ Treat Bars are so irresistibly tempting your pet bird will surely want more. Our nutritious treat bars are jam-packed with delicious wholesome seeds pet birds of all varieties will love to eat! Plus we added colorful and fun-to-eat candy-covered sunflower hearts and millet. These treat bars stimulate the natural foraging instinct and help relieve cage boredom. 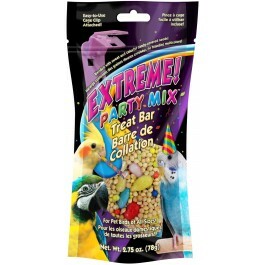 • For pet birds of all sizes. • Blended with sweet & colorful candy-covered seeds! White Proso Millet, Sunflower Seeds (hulled), Peanuts, Sugar, Corn Starch, Potato Flour, Guar Gum, Corn Syrup, Dextran, Gum Acacia, Confectioners Glaze (Shellac), Carnauba Wax , Honey, Natural and Artificial Vanilla Flavor, Colors: (Titanium Dioxide, Red 40, Yellow 5, Yellow 6, Blue 1, Blue 2).